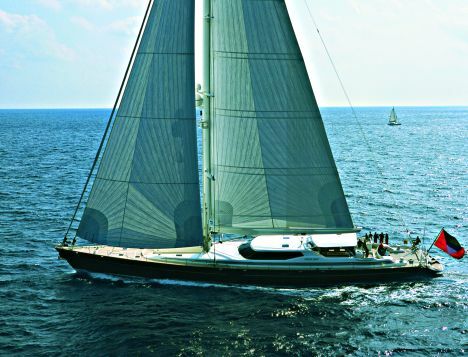 The African Queen, a 42.9 m yacht rigged as a sloop with an aluminium hull is one of the latest to come out of the Vitters Shipyard in Holland. Launched last June, she was followed by another example in October. At present in the Dutch shipyard a third one is in production which, in contrast to the first two, will be equipped with a cutter rig. The African Queen was designed by the Dubois Naval Architects Design studio, who have come up with a performance hull which is ideal both for ocean cruising and for open sea racing. 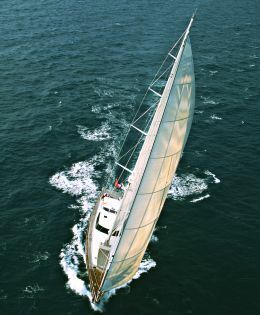 Wèll begin with the impressive sail plan, comprising a carbon fibre mast, 47 m long, and a boom, again in carbon, of 15.75 m.
Total sail area with spanker, genoa and foresail: 1,308 sq.m. Vitters Shipyard BV; Stouweweg 33; 8064 PD Zwartsluis; Olanda; tel. +31 38 3867145; fax +31 38 3868433; website www.vitters.com; e mail info@vitters.com. The mast has five orders of quartered crosstrees towards the stern, continuous topmast shroud and running backstays. The surface area of the spanker is 390 sq. m., the genoa 575sq. m. and the foresail 343sq.m. Total surface to the wind is 1,308 sq.m. which with the 35.0 waterline length is able to offer a respectable performance. As we mentioned, the structure and deck-house are entirely in aluminium but on board plenty of wood has been used for panelling and furnishings and for the lining of the deck. The African Queen has a slender profile and the dimensions of the deck- saloon are well-proportioned to fit harmoniously into the overall design. 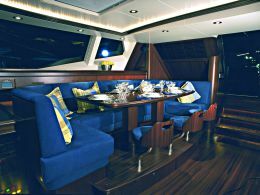 Inside the deck-saloon, in the forward starboard area, there is the indoor bridge, behind which is a dinette with table, L-shaped sofa and small sofa seating a total of 8, with opposite a coffee table and two armchairs, all lit by the large windows. Astern there is another dinette, although this one in the open, with two large crescent shaped sofas fore and aft with a central aisle allowing convenient access to the cockpit with its double helming station and complete steering gear. A central ladder from the deck-saloon leads to the deck below where astern, taking up the full width, is the owner's cabin, with en-suite bathroom containing bath and shower, separate office area, double bed and divan as well as, of course, large wardrobes and lots of space. 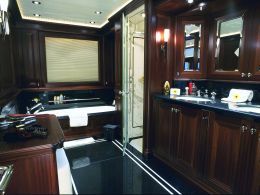 Toward the bow, to starboard, there is another smaller-sized double cabin with en-suite bathroom. 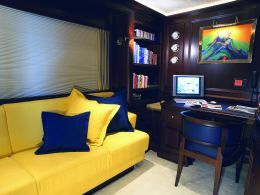 In the mainsail area there are two large double cabins both with en- suite bathroom and sofa. Forward of this area there is a lounge/dinette, with a dining table seating ten and a small lounge with double coffee table, armchair and sofa: there are also bathroom facilities in this area. 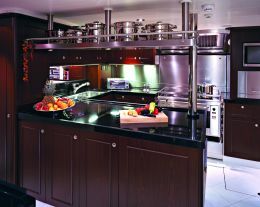 Continuing towards the bow there is a spacious galley to starboard as well as a utility room, a small office to port, forward of which there are holds, crew's cabin and two double cabins for skipper and mate. 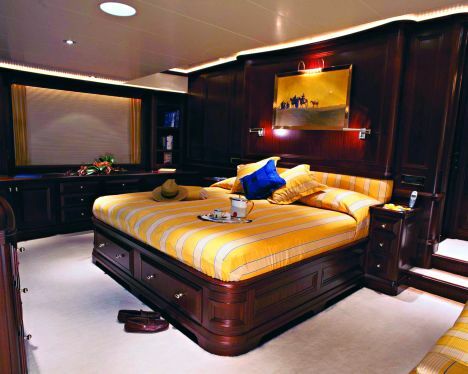 It's worth noting that the crew's quarters are in the same style and materials as the other cabins reserved for the owner and guests; in addition, they are independent and easily accessible. The interiors are lit by large skylights and by portholes of various sizes on the walls at different levels. 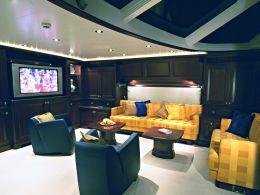 The interiors were designed by Redman, Whiteley and Dixon Design. Going back on deck, something that stands out on the main deck is the spacious garage astern which can house a fair-sized tender while at deck level, boxed into the stern area of the deck-house there is accommodation for a second tender, a Rib which is a good size for excursions along the coast with friends or family or for fishing trips and diving expeditions. Another feature of the exterior is the stern where there is a small central platform and two ladders to reach deck level. On board the African Queen everything is obviously in proportion to the whole; for example the anchors are two steel CQR, weighing 227 kg each, the bow propeller is a 75kW Hydrosta and the generators are two 50 kWA Northern Lights M668D. As we said the Dutch shipyard has made wide use of fine wood; for example the deck is entirely lined in 18 mm. 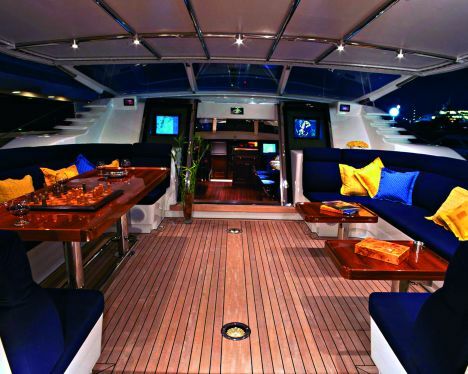 teak while the interiors are entirely in Sapeli mahogany, bestowing elegance and warmth on each setting. The blue hull, together with the teak-lined deck and the white deck-house, gives the African Queen an elegant look emphasised by a freeboard which is moderate in spite of the length of the hull. 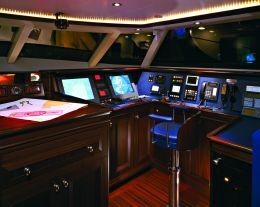 This is certainly a yacht for those who set sail for far horizons, whether these be North, South, East or West, a boat that brings to mind a verse by Fabrizio De Andrè: "for the love of travelling, travel". To which we should add: comfortably, quickly and safely.